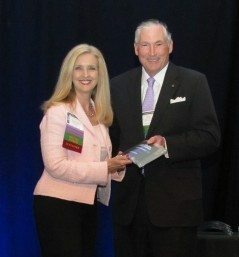 Janet Ward Black was formally presented with her award by attorney Mike Wells at the NCBA Annual Meeting. Greensboro attorney Janet Ward Black was recently honored as a 2013 Citizen Lawyer by the North Carolina Bar Association (NCBA). Each year since 2007 the NCBA has honored lawyers “who provide exemplary public service to their communities.” Nominations are taken from all members of the organization and submitted to the Citizen Lawyer committee for consideration. Janet Ward Black and other 2013 honorees were formally presented with their awards at the NCBA Annual Meeting. The award was created “to recognize and thank lawyers who exemplify the ideals of a citizen lawyer… those who inspire other lawyers.” Their contributions include volunteering for various programs and organizations, serving as appointed or elected public officials and serving in the military. Janet Ward Black has been very active in the community for many years serving in leadership roles in The Women’s Resource Center of Greensboro, Hood Theological Seminary, Legal Aid of North Carolina and Christian City Church of Greensboro to name only a few. Black serves closely with International Cooperative Ministries (ICM) out of Hampton, VA as a volunteer making mission trips to third world countries, hosting fund-raising events for the organization and serving on their Board of Directors. She is also working as a supporter of The Queen’s Foundation, a Greensboro-based organization that teaches young girls to be servant leaders in their communities. Janet Ward Black has traveled on numerous mission trips for Habitat for Humanity and Mercy Mission Teams.